RP42572PT is rated 5.0 out of 5 by 3. Rated 5 out of 5 by reallongdriver from Had no problems with the installation of the part. It matched fine. Part was delivered and arrived when promised. Rated 5 out of 5 by PACKER from WORKED LIKE A CHAMP! THE PART WAS EASY TO FIND THROUGH YOUR INTERNAL SEARCH ENGINE. IT WAS DELIVERED TO MY DOOR WITHIN JUST A FEW DAYS--THANKS! Temperature Knob &amp; Cover - T17 Series&nbsp;MODEL#: RP42572PT All I Need is the Cover. Is that Sold Separately? Is RP42572 the replacement for the shower below? Is this piece made of metal or plastic? I have a lockwood shower set that i bought at home depot around 7 years ago. The temperature lever is plastic and it is coming off. I would either like to replace with a real metal lever or completely change the trim. Please let me know if it is metal - and please also let me know what replacement trim kits would work for this set. Thanks! How do I remove the RP42572 cover so I can replace the cartridge? Thank you for your question. 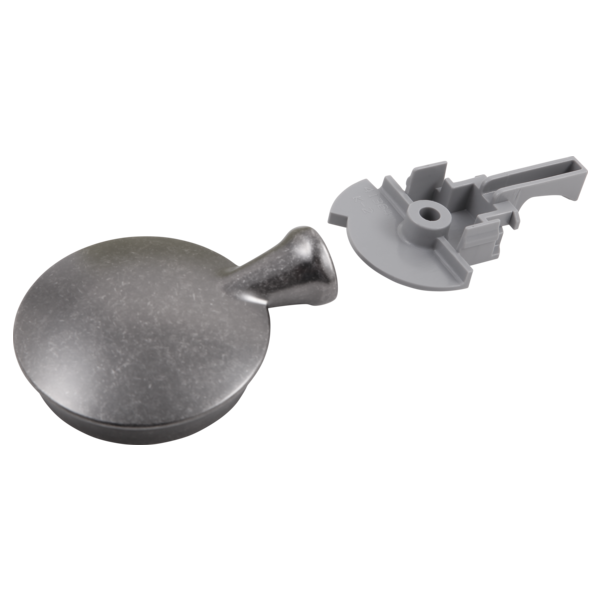 Delta Faucet model # RP42572 can be removed by squeezing the sides together silghtly and then grasping the pointed end. Pull up the pointed end to remove it. There will be a screw underneath to remove and then the bonnet nut can be taken off, followed by the cartridge.